There has been a lot of discussion about the new Canbus and its implications on the usage of aftermarket equipment. The Canbus system in its fullest implementation could allow for a single communication line and a single power supply to be shared among all components. For example a turn signal could be a module, supplied with power and the data communication would tell it to turn on and off. Additionally all of these modules would not need to be fused as they would monitor current and if a short or other fault occurs, would disable the circuit until the fault was cleared. There could be a module for the headlights, horn, brake lights, etc. The implementation on our motorcycles is the same except that all control “modules” are contained in a single chassis control module called the ZFE. This ZFE has inputs from all switches and controls and outputs to all components. Each brake light switch has its own input as does each switch on the handlebar controls. Sidestand switch, clutch switch, neutral, etc are also input to the ZFE as individual inputs. Each powered component such as horn, lights, windshield, etc. has its own output from the ZFE. The ZFE has the software logic to determine what output occurs based upon one or several inputs. Each output is fault protected and most are fault tolerant as well, meaning that as soon as a fault is corrected an output will resume its normal function without the need for external intervention. We do not need to be afraid of attaching external devices to the Canbus equipped bike, we just need to be careful not to overload any of the ZFEs protected outputs. Any of the outputs can also drive a relay without fear of triggering a ZFE fault. Some of the ZFE outputs such as the one for the taillight, monitor for over as well as undercurrent situations. An undercurrent situation (burned out bulb) in the taillight will cause the ZFE to run the brake light at reduced brightness for safety until the defective bulb is replaced. Under that situation you will see a fault indicated on the instrument panel. As soon as the bulb is replaced the fault will clear and normal function will resume. Any additional lighting for brake lights or taillights should be implemented using relays and most importantly the original bulbs must be left in place or a fault could be triggered. LED taillight replacements must be designed to account for the ZFE monitoring, by employing circuitry that draws enough current to let the ZFE “know” that the bulbs are functioning. Edit: One thing I failed to notice when I was looking at the schematic for the GT. The taillight/brakelight filaments are wired together. This means that the ZFE is controlling the brightness of the bulb (by PWM), rather than relying on the dual filament bulb. This means that when operating as a taillight there will be a reduced voltage applied to the bulb - the full 12v will be applied when used as a brakelight. This is different than the implementation on the K1200S and K1200R wich control each filament separately from the ZFE. For external equipment I would recommend one of two different approaches. For small equipment such as a GPS, radar detector, communication system or satellite radio, there is an auxiliary equipment connector just in front of the battery. It is a three-pin connector consisting of a ground (brown wire), power supply (red with white trace) and speed pulse (blue with green trace). A mating connector with pigtails can be purchased from your dealer using part number 83 30 0 413 585 for around $25. I have successfully used this connection on my K1200s, Michelle’s K1200S and my K1200GT. It drives an Autocom Super Pro AVi intercom system, a Garmin 2720 GPS and a Pioneer INNO XM radio on all three bikes. Since this is a fault protected output no fuses are needed. The Autocom draws less than 150 milliamps, the GPS well under 1 amp and the INNO can draw as much as 1.5 amps when charging its battery. The auxiliary output drives all three items without a problem. An additional feature is that this auxiliary output is a “retained power” output, meaning that it remains active for a few minutes after the key is turned off. For this reason I would not recommend this output to control a relay for auxiliary lighting. 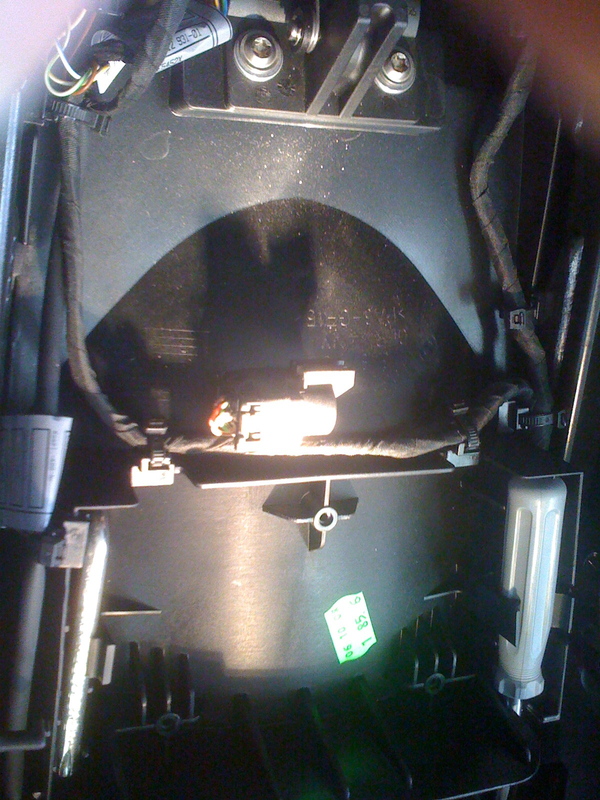 For auxiliary lighting I would recommend a relay driven from the low beam headlight wiring. Using the running light circuit to drive this relay takes it out of the “load shed” group and will allow your auxiliary lighting to remain on while starting the engine. Using the low beam headlight wiring (yellow with white trace) has the advantage of remaining off until the engine is started to prevent unnecessary load on the battery during the high load event when starting the engine. An additional feature is that this allows you to turn your key on to enable the GPS, radio or other accessory without the headlight or auxiliary lighting being on and draining the battery. On the K1200S the wiring to the headlight is easily accessible in behind the cover just to the right of the instruments. On the GT the wiring is in the same place, but lacks the exposed wiring that is on the S. I had to cut through a layer of cloth tape in a harness to expose the yellow/white wire to control the relay for my MotoLights. The actual plug and wiring for the headlights is behind the instrument cluster. There is no reason to fear using this headlight wiring to control a relay, by nature the headlight control line must be robust enough to control between 5 and 10 amps of lighting allowing for one or two 55-watt bulbs. There is a software update to the ZFE when the bike is fitted with a Xenon headlight (not available in the US) so there may be some concern that the ZFE is looking at a minimum current to the headlight circuit to monitor for a burned out headlight bulb. I am not sure how an aftermarket HID add-on will affect the ZFE monitoring. Last edited by randy; Dec 30th, 2006 at 10:41 am. Thanks Randy. That's a good read. And nice work! I need to rethink my thinking about using the Red/White wire to trip my relay. I thinks I'll be using the running light lead. Randy because I'm a dirt guy (I move dirt and trash for a living). Did you sodder all three positive leads together or is there another way. Yes all connections soldered and sealed with heat shrink tubing. As I said above I used the aux equipment connector for low current devices like the GPS, XM and Autocom - and a relay triggered by the low beam headlight for lighting (to keep it in the "load shed" group). Nice write up Randy, very informative! I also noticed something else in your post; the LT is gone from your signature. I'm guessing that means it's departed the stable as well? The shortest distance between two points is for people who don't ride! Yup, the LT is gone. It will be missed. The LT is still the absolute best for two-up touring, but with Michelle riding her own, our needs have changed. She just bought a K1200S (Granite Gray) and I the GT. We're heading up to Canada on them tomorrow. I am absolutely amazed at what a great bike the GT is. I'll elaborate more when we return from Canada. With this practical little helper you can connect various electrical devices to the BMW CAN bus single-wire electrical system that you want to be controlled by the ignition (key on = accessories on, key off = accessories off). This device allows the addition of electrical accessories to any motorcycle including any 2005 model year and beyond BMWs with the single-wire CAN bus system. It's easy to add electrical devices directly to the battery of the R1200GS, but to turn them on and off by the key, that is another matter. The BMW's complex CAN bus system will switch off automatically after a short delay. When the red light at the left side of your handlebar turns off, so does your device! And so does the BMW outlet. Basically the TPS 15 allows you to add a device and/or power outlet that is switchable directly by the BMW key. It senses the position of the key switch then draws its power directly from the battery to supply your devices. When you turn off the BMW key, the TPS 15 and it's devices or outlets downstream are deactivated immediately. 5 output terminals are provided and maximum output of the device is 15 amps total. This device is useful for any vehicle with 12-volt power that you want to be able to switch devices on and off with the ignition but do not want to draw power from the existing wiring harness. WARNING: recommended for professional installation. It sure sounds like it would work - do they say it will plug-n-play on the GT? Here is a link to the touratech website. Unfortunately both of the instruction sheets they link to on the page come up as blanks for me. .--------------------------- I am absolutely amazed at what a great bike the GT is. I'll elaborate more when we return from Canada. All the good talk about the GT makes me really anxious to see what the new LT is gonna be like! Just hoping against the odds that they keep something similar to the lines of the current LT instead of the angles and hawk look of the GT. Works OK for the "Sport Tourer" that the GT is, but would want the LT to be different. Works OK for the "Sport Tourer" that the GT is, but would want the LT to be different. As much as I hate to compliment you David (you get enough of that in here! ) . . . That is the most appropriate statement that I've heard made when comparing the GT and soon-to-come LT. Lord, I hope the new LT doesn't look like the GT. What sense would that make?! Then again...we are talking about Bee-Emm-Double-You . And their ways are not always like our ways. Aren't you due for a new bike in '07, David? Just don't get it the way you've gotten your last few. Not sure I would call it "due", just an interesting thing to consider if Kari decides once and for all not to ride again. I made a deal with her on some personal goals I am trying to reach, and if I hit them I get to buy a 2nd motorcycle. I'm thinking instead of the LT and a 2nd (FZ1, Vstrom 1000, Speed Triple, etc. ), I might pool those into a GT. And yes, if I do I would REALLY like to have my current LTs home be someplace nicer than the junkyard. I'm thinking instead of the LT and a 2nd (FZ1, Vstrom 1000, Speed Triple, etc. ), I might pool those into a GT. Yesterday, I took delivery on my GT's tour trunk. I can't believe the amount of storage I have now. And, how quickly it can all just 'go away' with a few clicks. Makes for a very capable and versatile sport-tourer. Damn, I'm channeling Joe! Quick, someone hit me with a 2x4!! I haven't heard much about the tour trunk(s) (are their 2?) can you give some details on it; size, what it will hold (hemet plus ? ?, laptop bag, etc. ), attachment, integration with the bike's lines/looks, etc. A trunk would be a must have for my commute. I'll take pics soon. It's raining at the moment. I can fit both our helmets inside (Nolan N100E), side by side facing forward. The BMW Motorrad Single Wire System (SWS) is an innovative, electronic vehicle wiring system for motorcycles. The data exchange is affected by means of CAN bus technology (Controller Area Network) via a single connection (thus the term Single Wire System), although in practice it is designed as a dual channel system. This vehicle electrical system offers a considerably larger range of functions compared to conventional systems in motorcycles, providing a significant reduction in wiring. Other advantages of this intelligent motorcycle electrical system are the weight reduction in the wiring harness, increased functional reliability and full diagnosis capacity. CAN bus in combination with the BMW Motorrad Single Wire System is thus a data network concept which makes do with a single data line. This connects various control units - rather like stops along a bus route (which is where the name "bus" technology comes from) - allowing permanent access to all data in the system. The basic principle of this technology is that all control units, sensors and consumers are linked into a network via a single shared channel designed for all signals, regardless of their later function. This network therefore permanently makes all information available at all times for all the components connected to it. Thus the complex cabling of each individual function is no longer necessary, greatly reducing the potential error sources of conventional vehicle electrical systems. At the same time, the permanent bi-directional data exchange between all control units provides the possibility of simple and extensive diagnosis of the entire system. The whole network makes do without conventional cut-out fuses: in the event of short-circuit or failure, the electronic system switches off the relevant function as a precautionary measure - the error can then be quickly identified when the diagnosis is carried out. In addition, errors are indicated in the multifunction display of the info flatscreen. This is a further bonus point for the high degree of reliability of this entire conception. After twenty years of experience with innovative vehicle electronics, BMW Motorrad has now taken another crucial step towards the future in introducing this motorcycle electrical system. Great write ups on the GT electrical system. Very detailed! I suppose it will make more sense once I remove some plastic pieces and start playing. Having done all electrical work on my vehicles with conventional wiring, this is a new frontier. "Those who would give up essential liberty to purchase a little temporary safety, deserve neither liberty nor safety." (Some really OLD friggin' White dude who couldn't have possibly known what he was talking about!) WARNING: Official HATE speech! No different really. I have 2 fuseblocks on my GT. One is straight off the battery, therefore it's HOT all of the time. The other is straight off the battery, but it's relay-controlled by the headlight. Simple. Got it. So there you have your switched and non-switched leads. Yes, very simple! Thanks, Joe. BTW, I have always used genuine Bosch relays on all my electrical projects. Never had a failure. Any preferences? No preference. I've yet to have any relay fail on me, regardless of the brand. On my GT, my relay-controlled fuse block is the Centech AP-1. So I just bought Centech's pre-wired relay kit. It's a 70A relay, and it was way over-priced...so it must be a good one. I used the Painless Fuse Box. It has switched and unswitched leads coming off of it. One fuse box does it all. I don't think the brand of relay matters if water gets in it corrosion and sticking happens. I like to pop the cap off them and run a bead of silicone. Another option is to buy sealed relays at a marine store. Yes, I checked out your link. Nice hardware. The prices are not bad at all for that level of quality. Last edited by jayjacobson; Nov 4th, 2006 at 9:48 am. I did a search and found painless. Appears high quality and avail in a water resistant edition. Price is right! I'll be doing some electrical upgrades to my 06 GT as well. What is the purpose of the Powerlett outlet if is load capacity is too low for Heated clothes or gloves? I'll be using the Aux connector in front of the battery for just a J+M cb amplifing a MP-3 signal. I'll also probally use either a Canbus approved adapter, or reconnect existing Powerlet outlet from battery for a battery tendor(or add 2nd outlet if neccesery). I'de use a TBS power relay for heated clothes or similar loads if needed. I'll be doing some electrical upgrades to my 06 GT as well. What is the purpose of the Powerlett outlet if is load capacity is too low for Heated clothes or gloves? It works with BMW branded heated clothing and certain BMW battery chargers. I was told at the bike show that the charger communicates with the bike for an optimal charge. Well; I dont know about that. If a battery tendor is installed on a fused link directly to battery, cant see better way. Maybey if battery tendor's circuits fail,the BMW's Canbus has an internal voltage regulator built in to keep from overcharge(battery on float charge). The reason that the outlet will not function with Gerbing or other heated clothing is that it is limited to 5 amps by the ZFE. The Gerbing jacket liner draws 6.4 amps - the BMW vest draws under 5. The BMW charger that Grif referred to is simply a 'smart' device that causes the ZFE to allow the charger to connect to the battery when the bike is off. The ZFE does not offer any special charger to battery conditioning. On my K1200S I connected the stock powerlet directly to the battery using this product. The GT uses a different connector for the powerlet which makes it incompatible with the above kit, so I added a second powerlet using the kit in one of the unused knockouts in the panel where the stock powerlet is mounted. I can also use the new outlet with any newer battery tender that is compatible with AGM and gel batteries. I just tried to install the Motorrad III and plugged the connector from the GPS into that same aux equipment connector in front of the battery compartment. Turned the key on but the GPS did not come on. Am I doing something wrong? I don't know. If you are speaking of the BMW Navigator III with the proper cable for the K1200GT (K44 version) then the GPS should work. Check the GPS with its AC power adapter, if it works plugged into the wall, the bike wiring probably has a problem. Newbie here. Just purchased a 2009 K 1300GT. I am wanting to use the accessory plug that is in front of the battery-much as Randy has done on his bikes. The three wires are for power, ground, and ??Speed??. What do I connect to the speed wire, if anything? What do I connect to the speed wire, if anything? Second, don't connect the Speed wire to anything. It is used on some integrated gps units to help calibration when you lose signal (a tunnel, heavy trees, etc.). The vast majority of the bolt-on gps units don't have a vehicle speed pulse input, so just leave it unconnected. Thanks Ken for the reply. I should of figured that out but my head was into the "bus" stuff. I do have an Alpine GPS unit that does accept a "speed" input. My head was looking elsewhere. While we are the can bus and accessory plugs, does anyone know what the connector under the passenger's seat is used for? Could it be that the wiring harness is common to the LT and this is for the tourpak lighting?? I believe that may be the plug for the alarm or TPM. I was sure hoping to find a plug that I could use for some rear lights. The plug is prewired for the alarm system. I put on some HyperLites and with the order came directions on how to wire the additional lites on bikes with the CAN bus. So, I am good to go for now.